Read receipts for Outlook that track email opens and clicks, even if your contact isn't on Outlook. Read receipts in Outlook have never been easier or more powerful! Boomerang's read receipts let you see when and how often your emails get opened and clicked. And unlike Outlook's traditional read receipts, Boomerang's email tracking works even if your receipient isn't on Outlook. You'll even get notified if your contact reads your email on mobile. Upgrade your read receipt today! New favorite tool? Boomerang for Outlook. A-ma-zing add-in. Measure the effectiveness of your cold email efforts. Know if someone read your email before following-up. 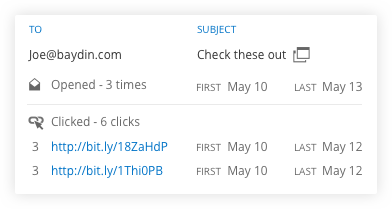 Discover which links in your emails recipients click. 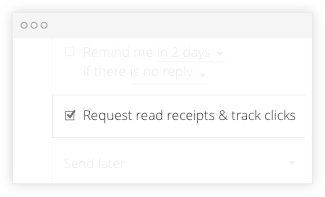 Boomerang's cross-platform read receipts notify you when your recipient opens a given message or clicks on any links it contains. They work regardless of the email service or device recipients use — even if your recipient is on Gmail or reading your message on their phone! You can attach Boomerang's read receipts when writing an email on Outlook 2013, Outlook 2016, or Outlook on the Web. Unlike other open tracking software, Boomerang's read receipts respect privacy and maintain trust. Recipients are notified that a read receipt will be provided and have the opportunity to opt-out. Boomerang does not track the recipient's IP address, location, or device. Your emails are thus less likely to be flagged as spam, and including a Boomerang read receipt actually increases the chance of a response! P.S. Boomerang brings cross-platform read receipts to Gmail and Google Apps too. Learn more about Boomerang's Gmail Read Receipt.